Dorothy A. DiTommaso, 87, of North Huntingdon, died Monday June 4, 2018. She was born October 22, 1930 in Trafford, the daughter of the late Marko and Mary (Fabijnac) Turkovich and was also preceded in death by her husband Angelo L. DiTommaso and a brother Paul Turkovich. Dorothy and her late husband Angelo co-founded the popular eatery Angelo’s Ristorante in 1956 on Rt. 30 in Irwin. 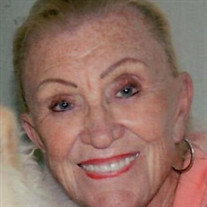 She was a member of Immaculate Conception Church, Irwin, a former member of the Irwin Garden Club and belonged to several golf leagues. Cooking was her passion. Surviving are her children John M. (Sana) DiTommaso, Denise (Vince) Dalicandro, and Debbie (Robert) Huey; her grandchildren Christian Koury, and Angela and Alyssa Huey; and her great granddaughter Viviana Koury. Friends will be received from 9 to 11 a.m. Saturday at the William Snyder Funeral Home, 521 Main Street, Irwin, 724-863-1200. Parting prayers will be held at 11 a.m. with a Mass of Christian Burial following at 11:30 a.m. in Immaculate Conception Church with Father John Moineau as celebrant. Entombment will follow in St. Joseph Cemetery, North Versailles. The family would like to thank the staff of Brookdale, Murrysville, and Heartland Hospice for all the kind and compassionate care. In lieu of flowers a contribution can be made in Dorothy’s name to a charity of choice. For online condolences please visit snyderfuneralservices.com. To send flowers or a memorial gift to the family of Dorothy A. DiTommaso please visit our Sympathy Store. "Arnold V. Plum" || "Betty Ord"